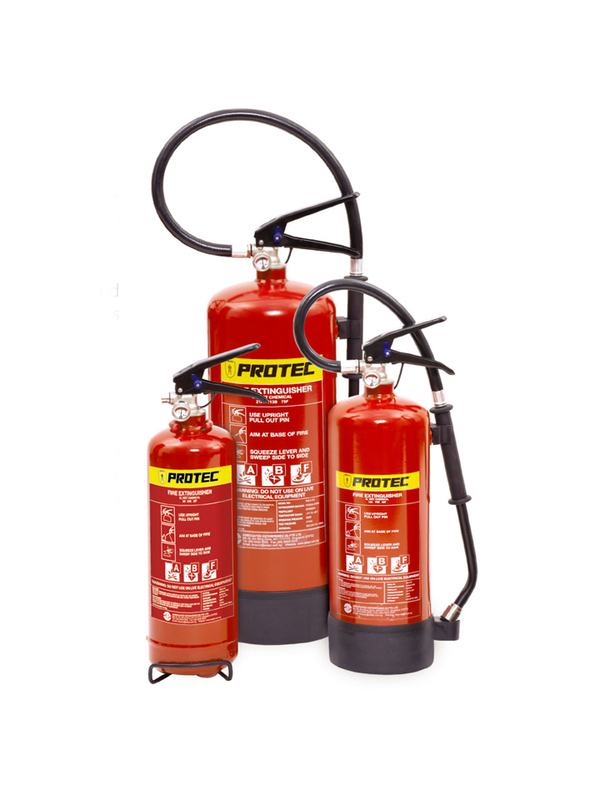 “Protec” Class F Wet Chemical Foam stored pressure portable fire extinguishers are manufactured and conformed to BS EN3 Parts 7 to 9 and SS EN3 Parts 7 to 9 : 2012 standards under strict ISO 9001:2008 Quality Management System. The chemical in this extinguisher is based on nitrogenated derivatives and ammonium salts of phosphoric acid and hydrocarbon and fluorinated surfactants in aqueous solution. It is specifically for dealing with very high temperature (360°C+) cooking oils and fats use in large catering kitchens, restaurants and take away establishments. Due to the high auto-ignition temperatures, cooking oil fires are very difficult to extinguish. Hence, conventional extinguishers are not generally effective for cooking oil fires because they do not cool the oil sufficiently and may cause flash back, placing the operator at risk. The specially formulated wet chemical foam has a very strong smothering action on cooking oil type fires and forms a very compact foam on the surface preventing re-ignition. • Tested for Class A, Class B and Class F fires.